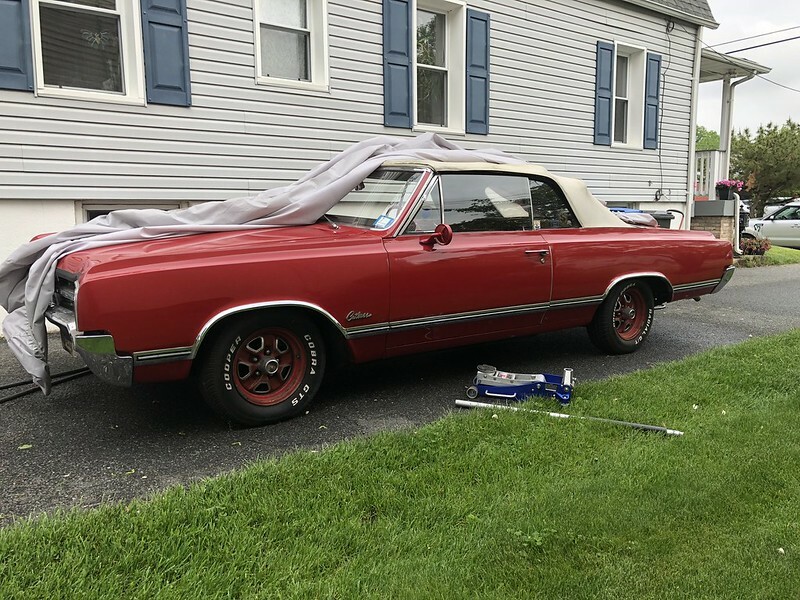 Took ownership of my father's '65 Cutlass Conv. The year was 1991, I was an 11 yr old boy who loved anything with wheels. Trains, bikes, scooters, you name it, I was obsessed with it. My father was a social worker and my mother a substitute teacher. My brother was 14 and for all intents and purposes, he doesn't matter much to this story . It was around the end of June and my mother and father called us into the living for a "family meeting", which to this day I only remember happening twice, this event and when my mother was diagnosed with cancer. The topic was "Your mother's going to get her driver's license". Yes, my mother who was 43 at the time never had her license. She never drove, had no real desire to drive I thought, and this was normal. Well she decided to go to work full time and hence needed transportation. What this really all meant though was it was car shopping time! 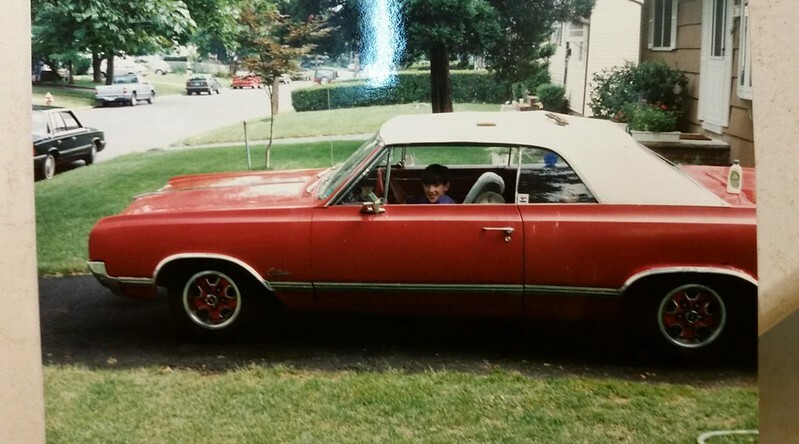 With the family income being low and my father's commute was a lovely 3 miles round trip he could pretty much pick up any beater and make it work. 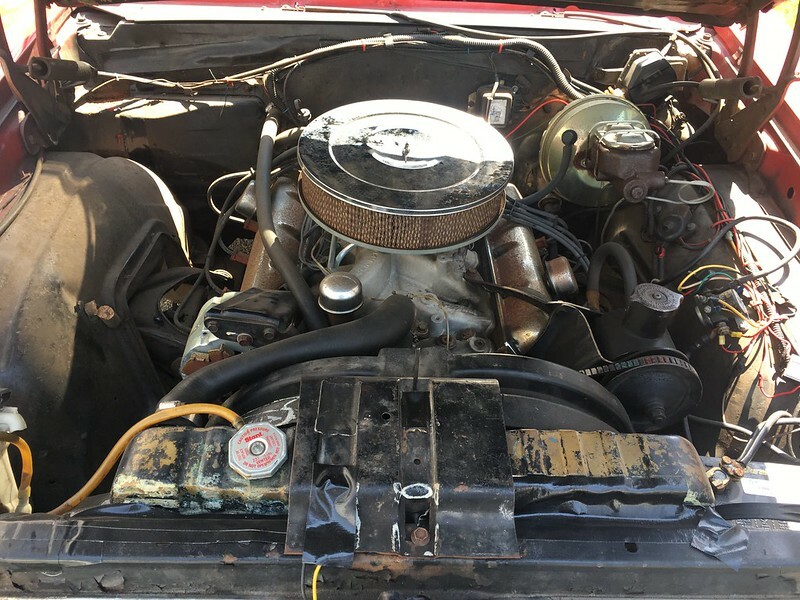 He was / is a pretty handy guy when it comes to cars, used to tinker with an old Mustang in his 20's, rebuilt the heads on his brother's C3 Corvette, etc. Certainly no stranger to points and carbs, in fact he still prefers that to this day. He wanted a classic. 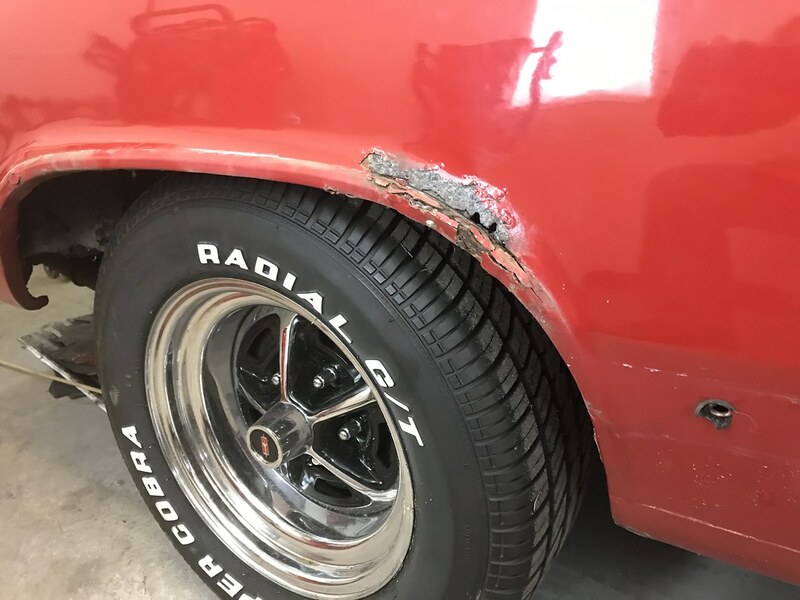 Originally he was shooting for another Mustang (my mother's father killed his while borrowing it one day) but similar to today, the good ones were over priced and the more budget oriented ones were rust buckets. 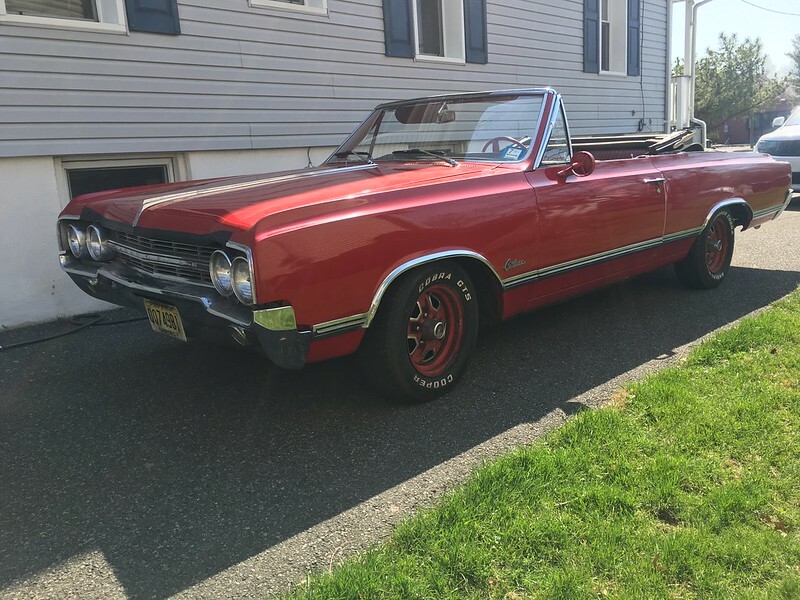 Then one day he came home and said he found it, a 1965 Oldsmobile Cutlass Convertible for $1500. "Wait, that's not a Mustang!". There's a little more to the backstory here. Just for a second, give that scenario a thought. 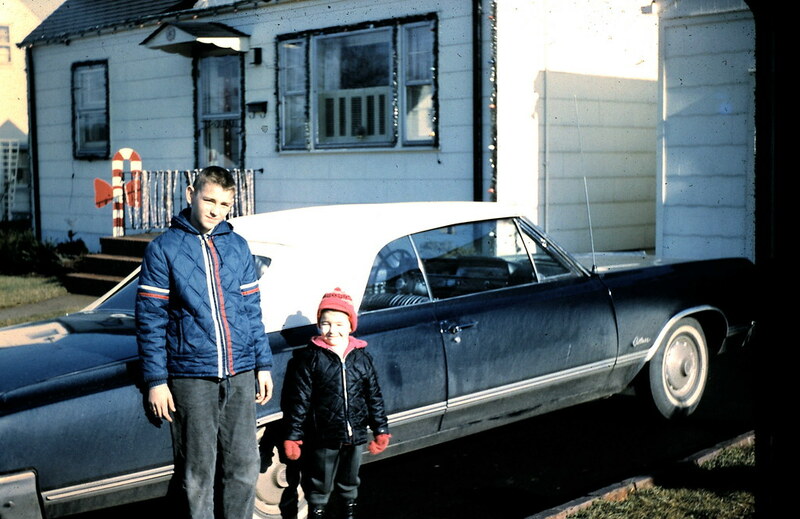 In 1965 the Cutlass wasn't exactly the top choice for cars. 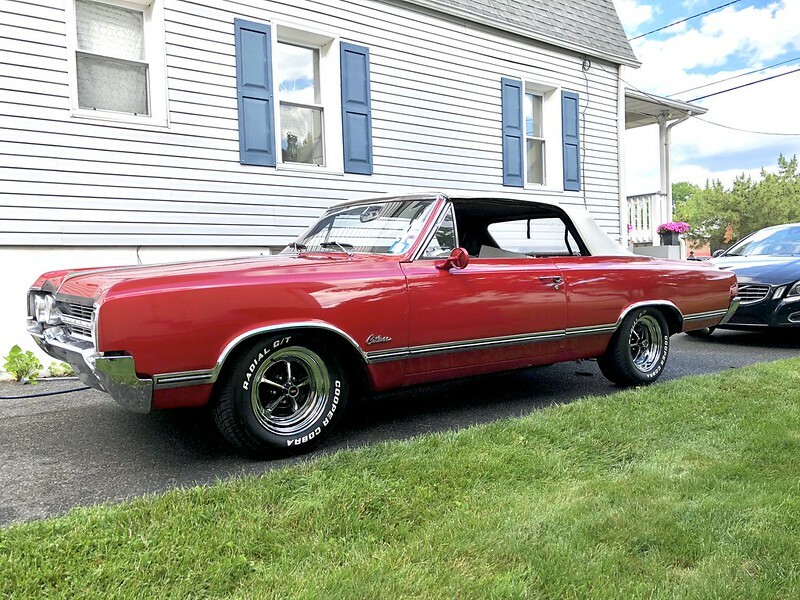 It wasn't the 442, it wasn't a pony car, it wasn't something completely luxurious, it was a Cutlass. 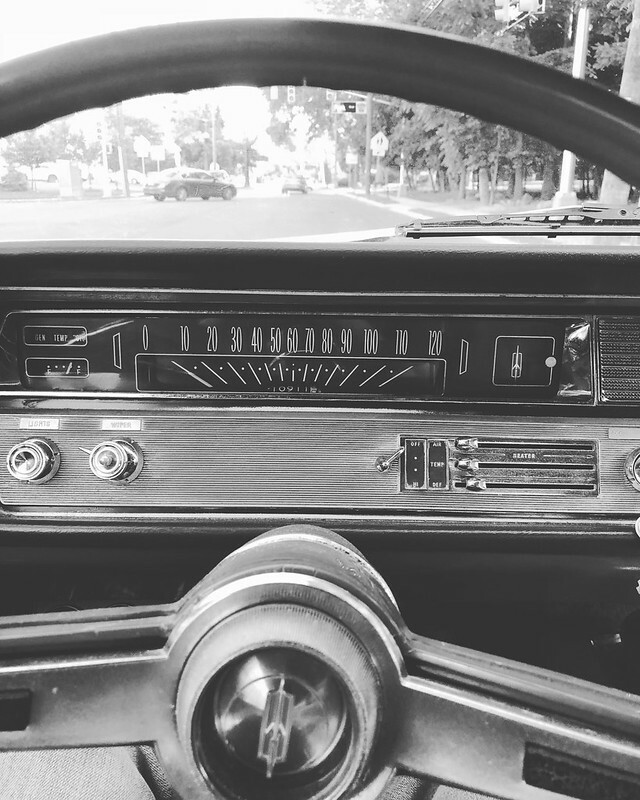 Similar to what a 2 door Honda Accord would be in today's age. No one specifically cared for them. They were really nothing more than "regular cars". Anyway, back to 1991. What isn't pictured was the parts car it came with. My father handed me a box of tools and just said "take it apart". If I had to pick a single moment that started my car obsession, it was that. 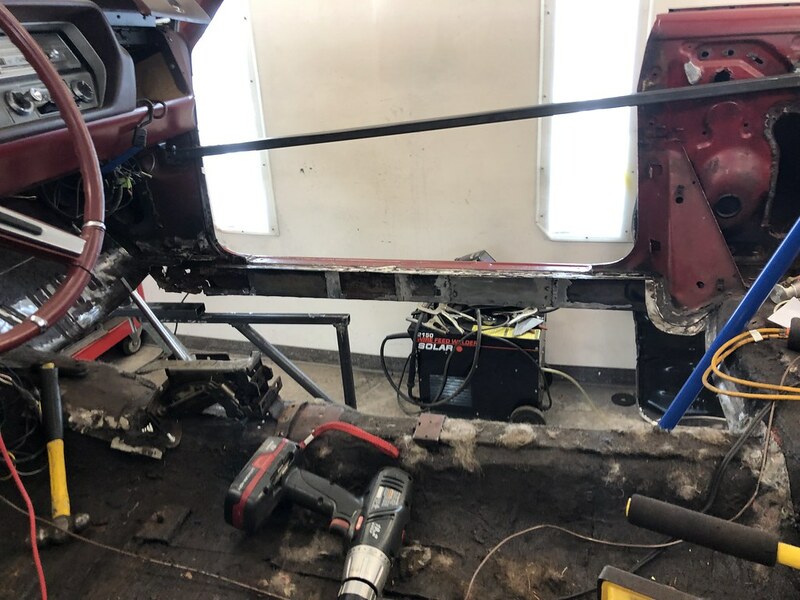 For 2 weeks we wrenched on that thing removing fenders, trim, doors, seats, when the dragged it away it was a frame, an engine block and a bare shell. The stories I have with this car are enough to publish a book out of. I won't bore you all here with them but one might pop up from time to time. After my mother passed away in 1999 my father decided to do something nice for himself (he truly deserved it!) and bought a 1964 Corvette Convertible. 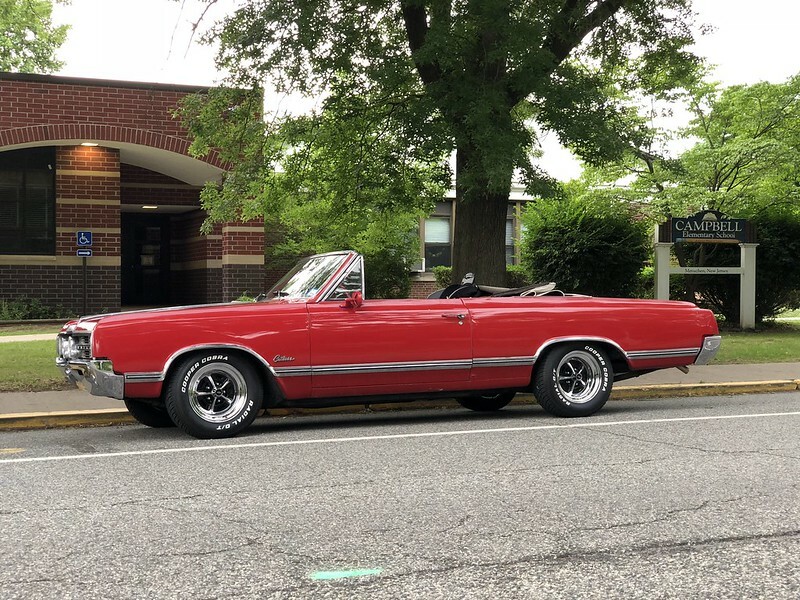 It was all original, 77k miles, beautiful car. He never drove it. He was always worried about, any damage to the body and it would lose value. I kept telling him to sell it and buy something he could enjoy. Fast forward to around this time last year, he finally saw the light. 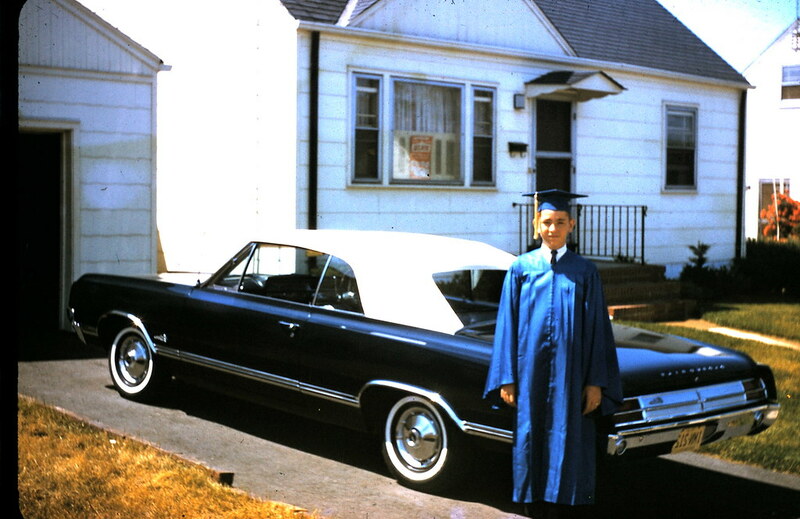 I sold the Corvette for him and he picked up his dream car, a 1963 Buick Riviera in black over white interior. (It is such a beautiful design and if you don't know much about it, look it up. The car design itself has an interesting story behind it.) 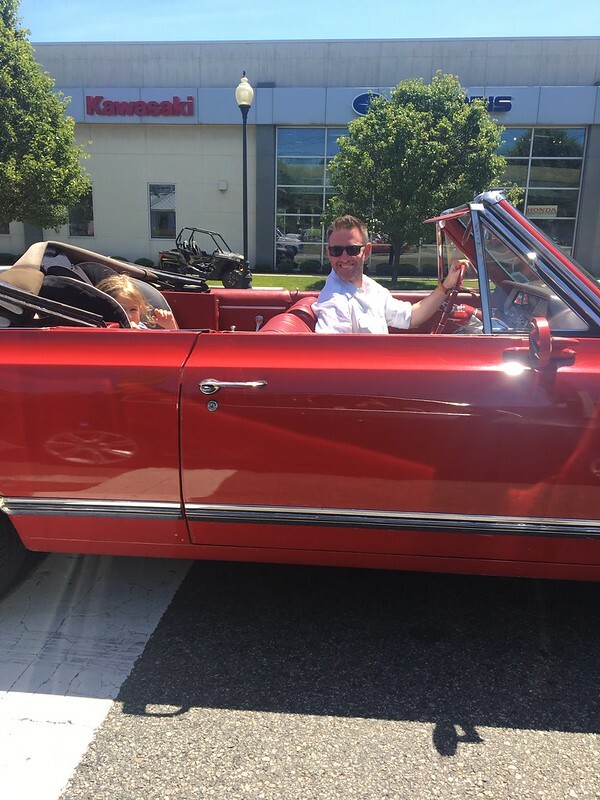 He decided he no longer had time for the Oldsmobile and wanted to pass it on to me and watch me enjoy it while he could. 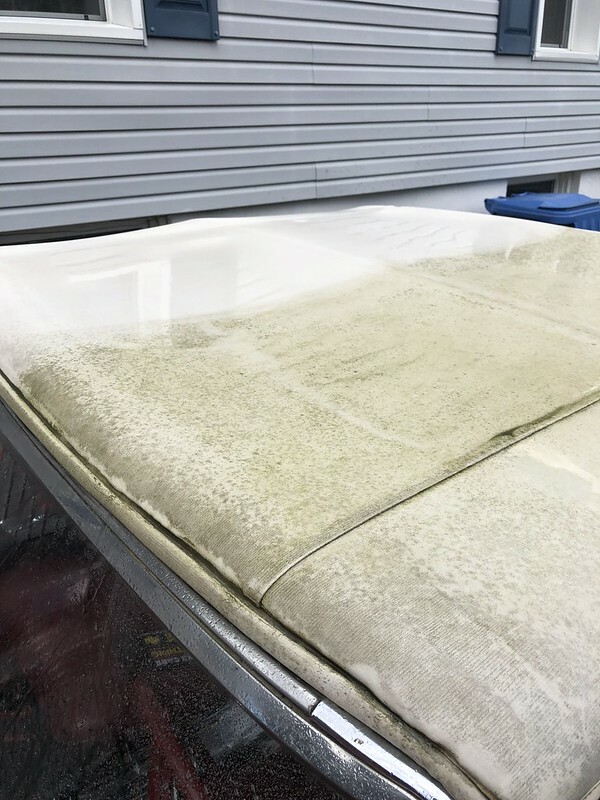 The car has been with my father for the last 27 years. It has had the interior redone, top replaced, engine rebuilt, suspension redone, painted...and all with change. Every major system has been refreshed except electrical. 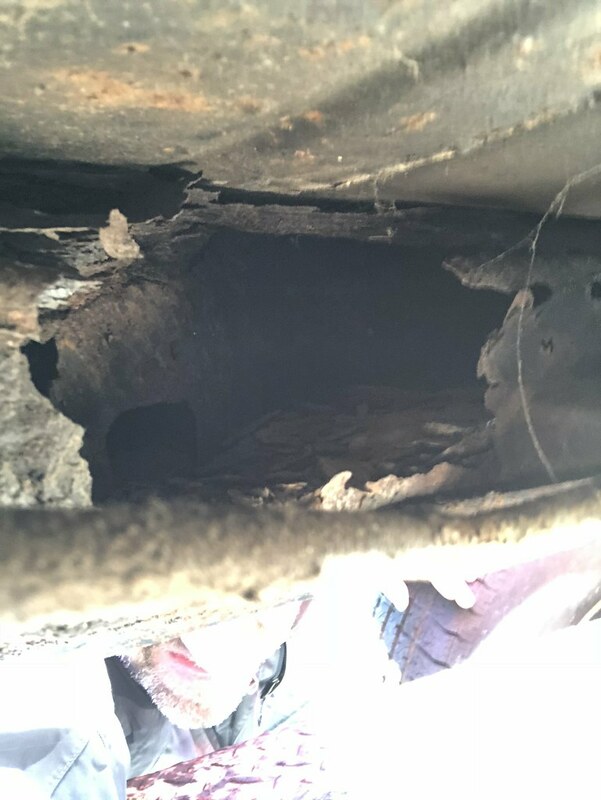 But as old cars do, it has deteriorated over time. Rust is starting to show again in the usual places, it could use a new top, transmission could use some work, etc. It is now my time to continue on with this car. I've started this thread to start documenting the preservation of it. 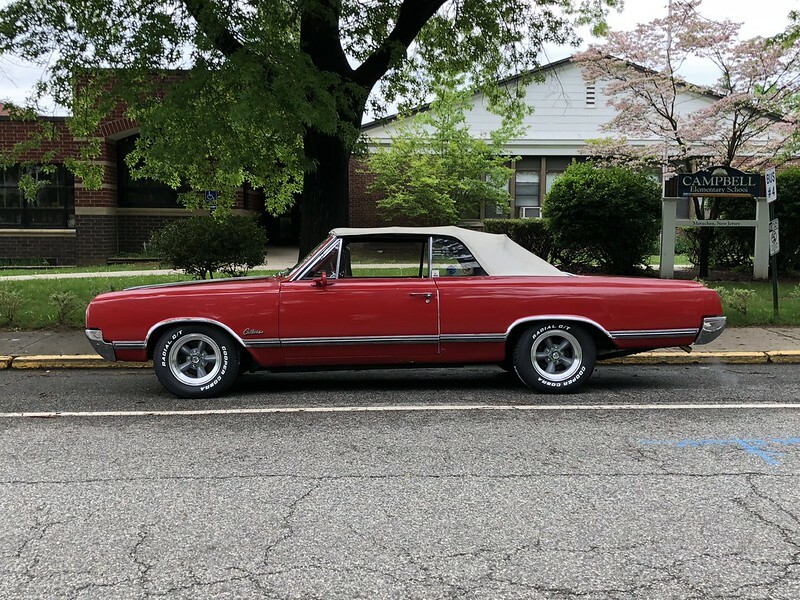 This will not be a restomod (not yet at least), it will not win any shows, and I don't plan on taking it to Barrett Jackson. All I'm looking to do is have it around for my daughter to take to the prom (if she wants) and for my family to just cruise in. Here's how she was delivered to me this past weekend. First priority is wheels and tires (on order) and a good cleaning. 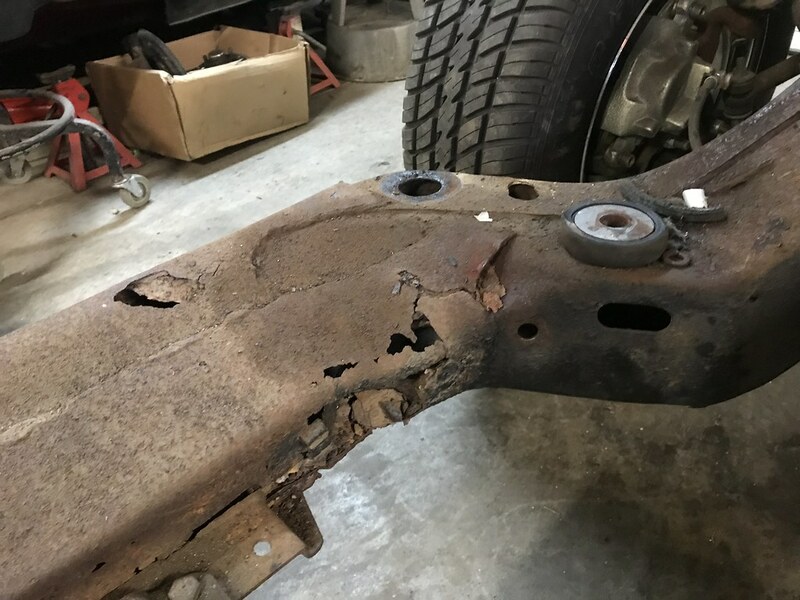 I'll have to plan for some body work in the near future and there's some rust on the frame that I need to solve (might end up with a frame off at some point). I am honestly overwhelmed with emotion. I'm just hoping I can keep this thing on the road for the next 50 years. Great story, hope you have many years of enjoying you new toy. Great story, good luck with the dream scenario. 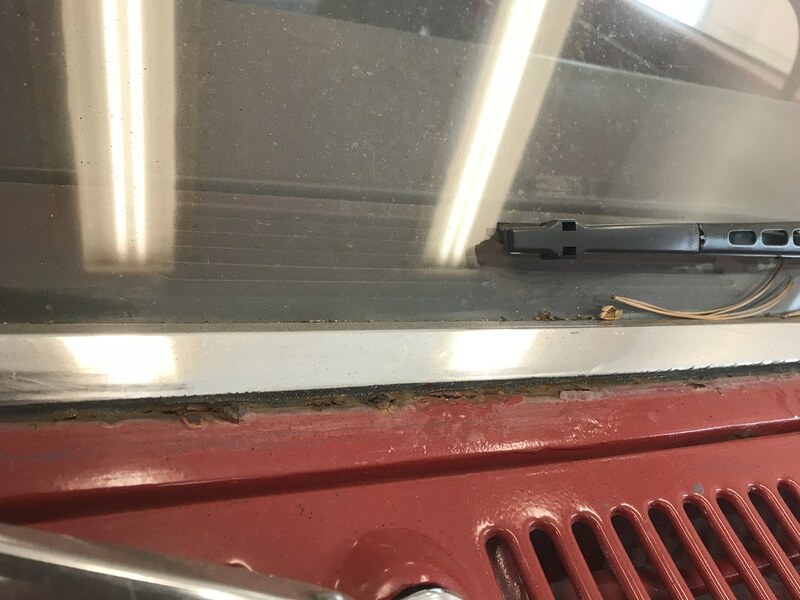 Great story, noticed it has the a/c radiator and shroud, did it have a/c ? That was indeed a great story with some awesome pictures! Very nice car with some great history behind it, Definitely a keeper! What a cool story, and history on your car! I've got several 1964's as do others here so as things progress let us know if any hiccups appear. If you have time it would be fun to document your work in the major build thread. Even if you don't go the full frame off, we would all enjoy watching the work you do to it. Thanks for all the kind words. I am in the final stages of upgrading my track car (supercharged Miata) but once it's done I'll get to work. No AC, had some problems overheating. I'm thinking about upgrading to an aluminum radiator and e-fan instead of the puller mounted to the water pump. Very nice, keep us posted. That really is a great story and a very special car for you. Keep us posted as you progress. As you have already witnessed, there are lost of people here with lots of knowledge that are glad to help. I did notice the house turned around in the first two photos. That is a wonderful write up on the car and yourself. You connected a lot of dots. That car is in wonderful shape and its in the right home. Next stop was Wheel Vintiques, turns out they make the wheels for Coker. Coker buys in bulk. They only make an order when there's demand with a few extra sets built in. I was quoted 4-6 weeks from WV, not bad. They should be here mid-May. I call them up after 5 weeks to ask for a status update and was reminded of the 4-6 week build time. My response, "Great. They'll be ready in a couple days then". To which I got this response, "Oh, no sir. We don't work on the weekends. We still have 3 more weeks left to deliver your wheels.". Tell me how that makes any sense. The guy was basically telling me it takes them 28-42 working days, not 4-6 weeks of elapsed time. Why don't they just then say 6-8 weeks build time? So I headed over to Summit, ordered a set of American Racing Torque Thrust Vintage wheels with grey centers in 15x7 and 15x8. Still a good vintage look, "ok" backspacing though I would have liked it to be a little different, and a bonus of an aluminum wheel vs. the steel chrome wheels i originally planned. These should be lower maintenance, a bit lighter, and I don't run the risk of rusty or pitted chrome. I got the car registered yesterday, mounted the new wheels, and took it for a spin around the block. God did I miss the sound of a cammed V8. I can't wait to start driving this thing. The wheels made a huge difference in looks. I absolutely love it! 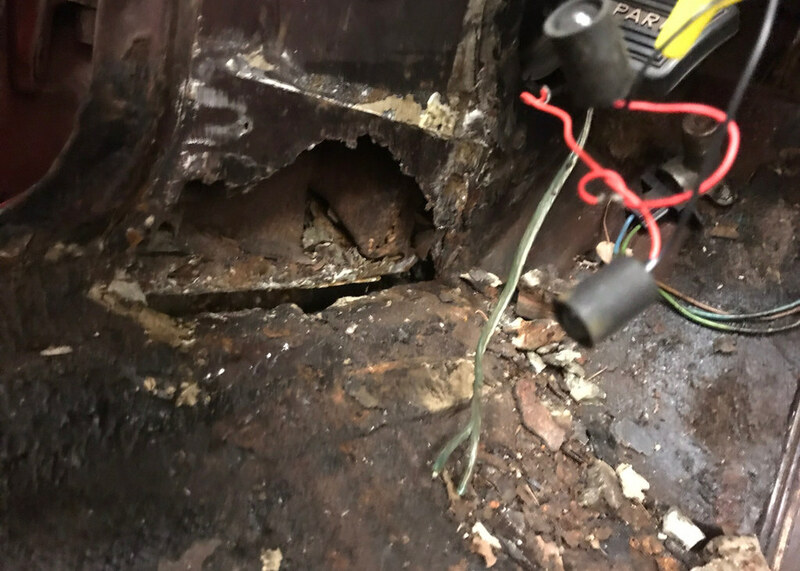 As it turns out this car has been in at least since the early 80's. In the mid-90's one of the local towns started a cruise night once a month. We met a guy who owned the car in '83-'84 as a college student. 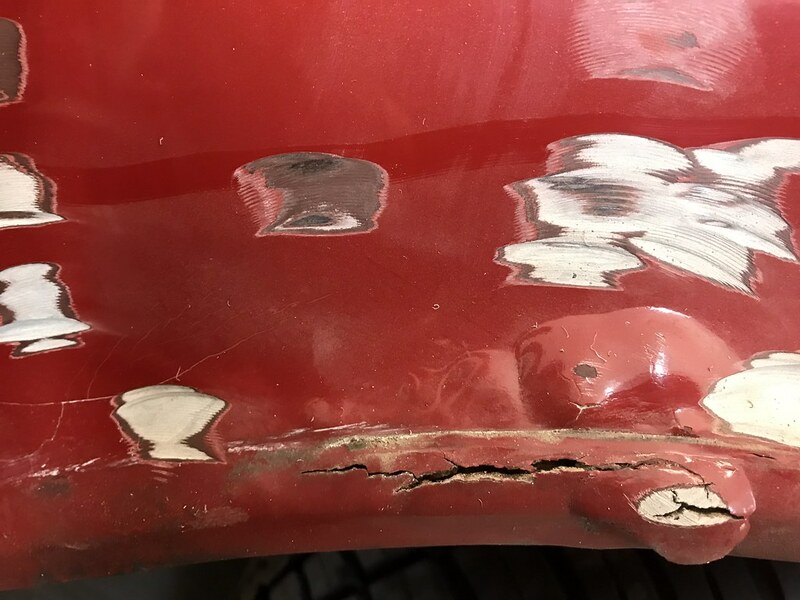 He explained all the little dents he added to it and even showed us some sticker outlines on the bumpers. He still lives in town and has reconnected with me. I'm hoping to get some pictures from him. He's now a certified Oldsmobile nut. The Torq Thrust wheels didn't quite work out. There's an issue on the passenger side where the spring isn't seated correctly which effects the ride height. It's enough of an issue that the passenger tire was rubbing on any left hand turns. The SSI wheels I originally ordered and cancelled (or so I thought) made their way to my house a few weeks ago, I decided to give them a shot. Wheel Vintiques did a nice job, the chrome looks good, paint was done well and the welds on the wheels look good. The quality of these I think are great. 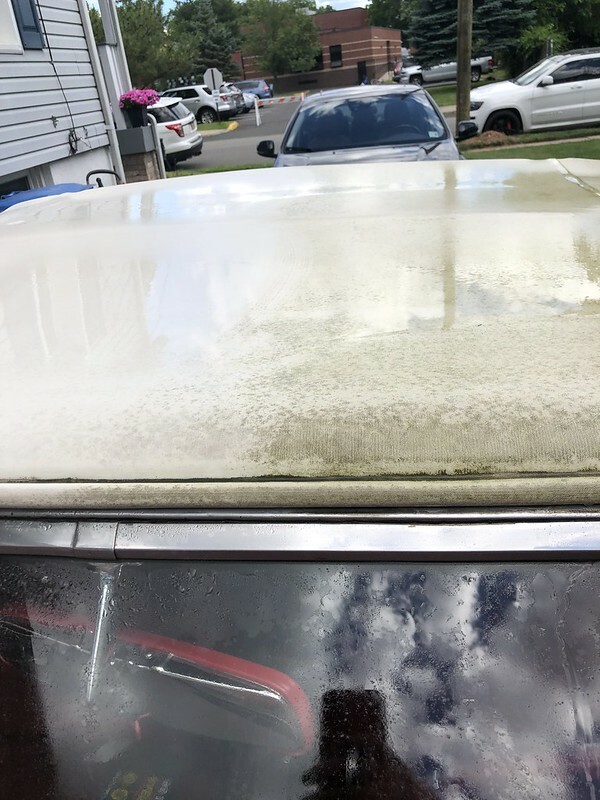 I got home from work early on Friday so I ended up cleaning the top, washing the car and giving it a layer of wax. 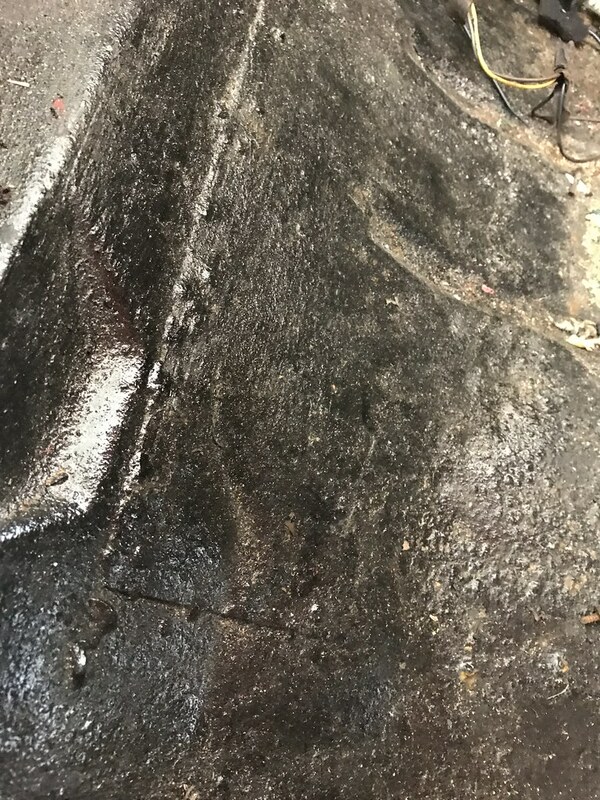 It desperately needs to be buffed but I'll wait for the garage to be free before I do that. 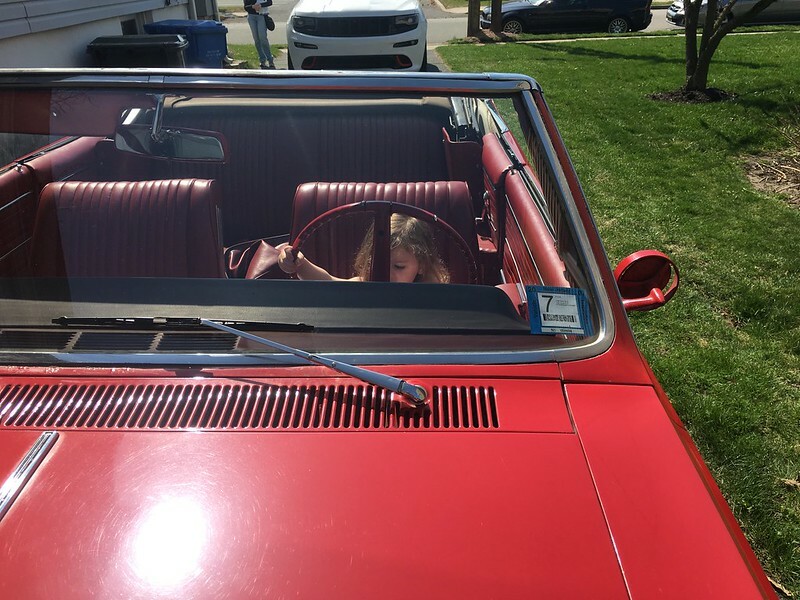 I also gave my 3 year old daughter her first ride in a convertible. I don't think she was impressed. It felt good driving her to my father's for the big father's day bbq. Next up is to try and clean up the engine bay a bit, new valve covers (the aftermarket chrome ones tend to leak) and rewire the aftermarket gauges (water temp, oil pressure) so that they turn off when the car is off. Some pics from the weekend...god I love this car. Haven't made a ton of progress on the old girl, other competing projects in the way. It also doesn't help it barely fits in the garage, no room to walk around the front or back to wrench on it. The biggest update I have is I found a donor frame! As I mentioned earlier there are some frame rot issues. 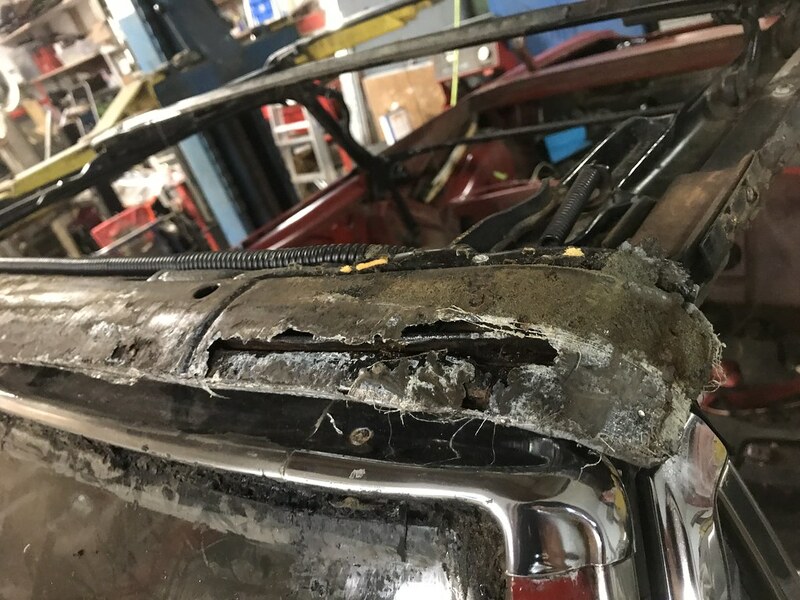 In the 60's the hardtop A-body frames were mostly C channel but in order to stiffen up the chassis for the convertibles they boxed in the frame. between the front and rear wheel the frame basically looks like this [> with the bottom being flat. 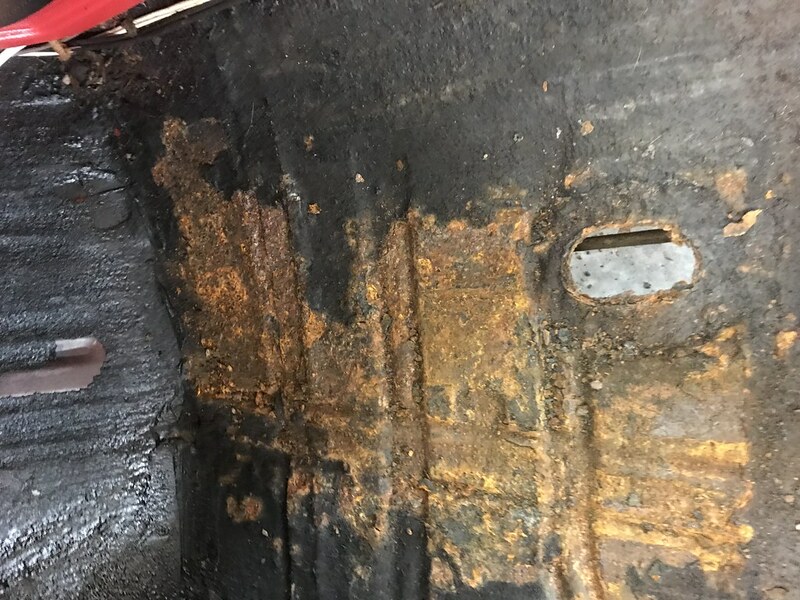 Over time it fills up with dirt which then traps moisture and then creates rust. 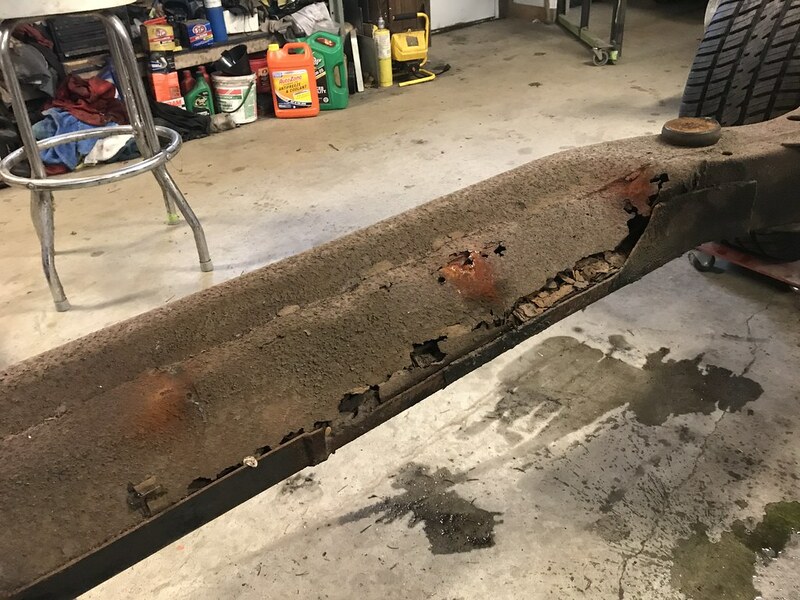 There's probably a spot a foot long in front of the trans crossmember and another foot in front of the rear wheel that is rusted through at the inner point where all that collects. After looking at it over the weekend it's worse than I thought. I knew eventually it would need a replacement frame, just didn't know when. 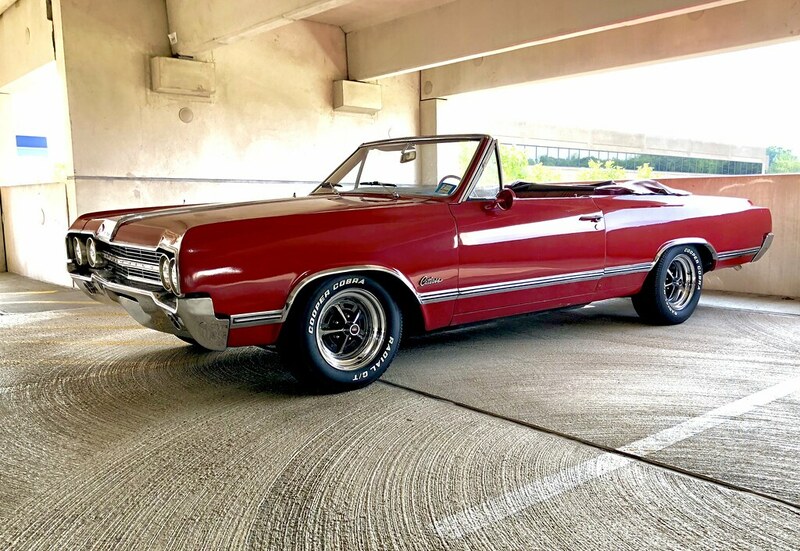 I was cruising Facebook one afternoon and there was a guy trying to sell a '64 Cutlass convertible project car. It was his father's, he passed away and the son was selling the project. The car had a lot of good parts on it including a nicely built motor, good suspension, brakes, rear end, etc. but I really wasn't interested in any of it. 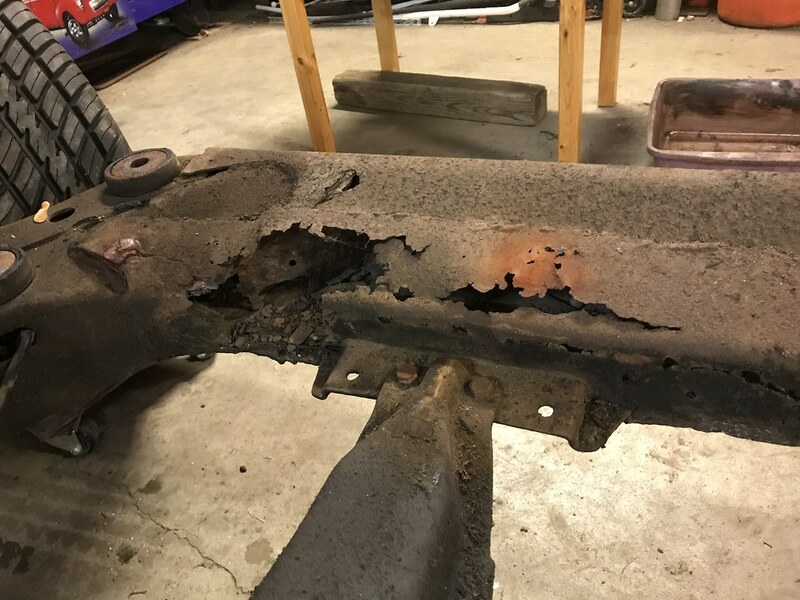 I told him if he decided to part I'd take the frame if it was in good shape. A week or so went buy and he calls to tell me he'd sell me the frame. He tells me the story of the car and mentions at one point the frame was sand blasted and powder coated. I was sold, I had no idea what I was going to do with it but hey, it's very rare to find the right frame less than 2 hours away from my house so I snatched it up. The car guys here in my office tend to gravitate towards each other, one of them does restorations on the side and he's now retiring from his day job. I mentioned the project to him and we somehow decided he'd do the work for me starting in January. I'm unsure yet what my involvement will be. If I had it my way I'd have them separate the body from the chassis, do a full restore on the body including new floors, body work and paint. 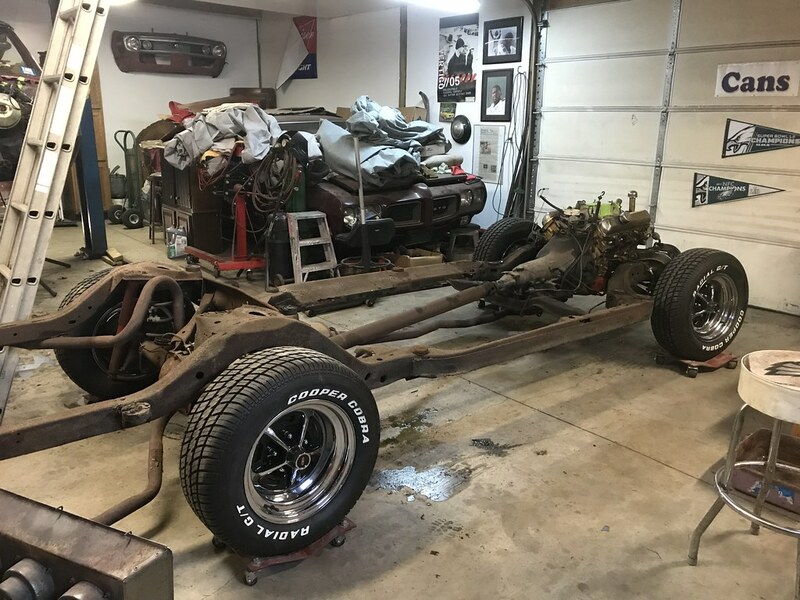 I'd take the chassis home, swap the parts over to the new frame, and return it to the shop to remount the body. Now that all means I have time to do this and the weather cooperates. I'll update this thread as it goes. Here's a picture of her in the parking deck today. She photographs so well it's comical. And here's the Riviera that stole my dad's heart and has consumed him ever since. The Thanksgiving break was extremely productive on the car front for me. Wednesday I was able to pull the motor from the Miata (see other thread) and Friday the guy who is supposed to work on the Olds came up to grab it plus other parts we had lying around. I work for a medium sized biotech company within the IT department. As I'm sure you're all aware, us car people tend to find each other fairly quickly. 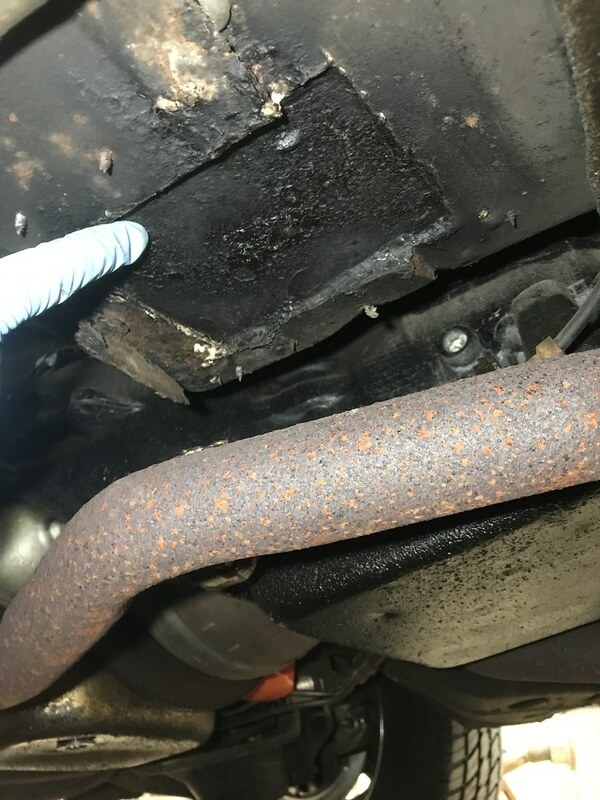 There's a guy I've worked along side of for 5-6 years that tinkers with cars on the side. He and his buddies have a nice big building with a paint booth, rotisserie, etc. and generally buy, restore and sell classics. As of last Wednesday he is now "retired". 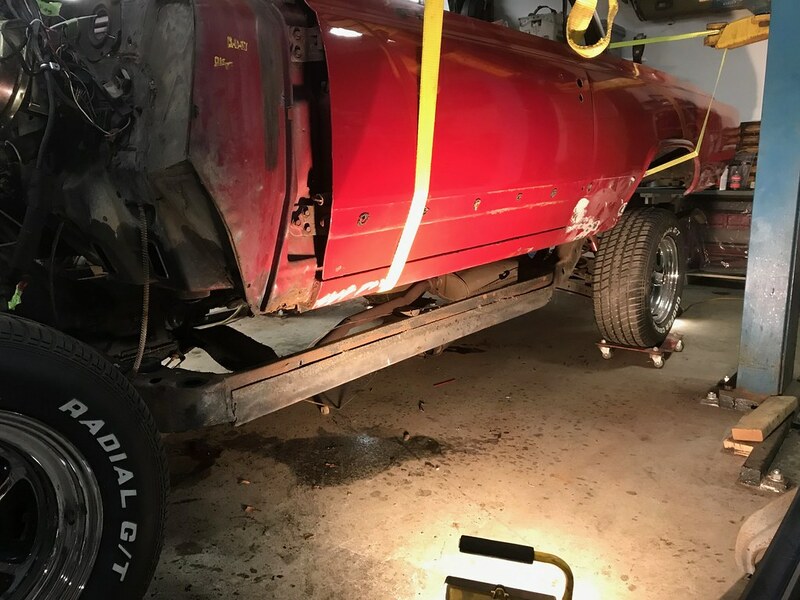 A few months back I asked him if he would be willing to take on the task of doing the frame swap and fixing rust on the body, he told me yes but not I had to wait. He's got another project being completed right now, should be done by the end of the year. He'll then start tearing into the Olds and making it right. On Friday he came up with his truck, we loaded the Olds onto his trailer and headed to my father's house to get the parts hoard he had stashed in the shed. 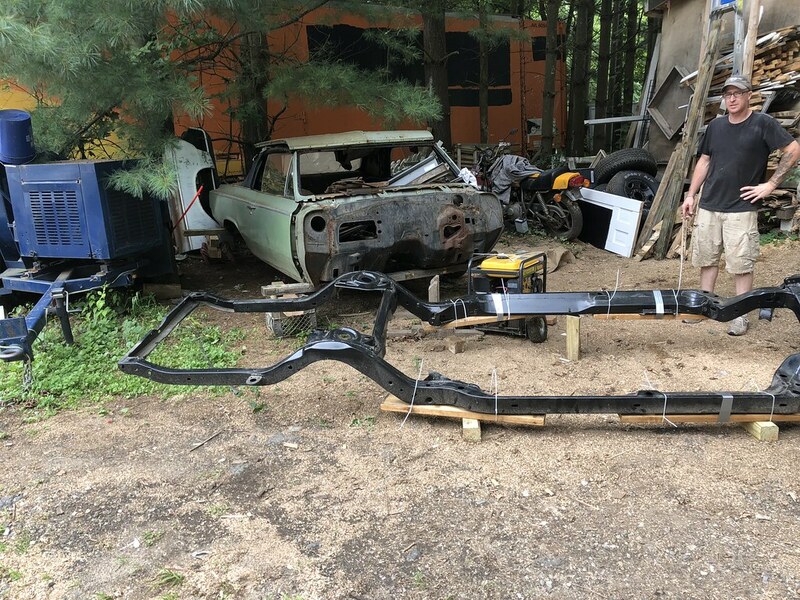 Fenders, doors, hood, trunk, inner fenders, rear quarters, trim pieces, taillight lenses, axles, it's all accounted for and ready to be put to use. I can't begin to tell you how excited I am for this next step. As I said previously, I really do love this car. It's got so many memories attached to it, and I still have so many more I want to create. I can also now say that my father shares the same feelings. As we were saying our goodbyes to the restoration guy I could see him staring at the car as you would look at a loved one before surgery. He climbed onto the trailer, took another look inside, patted the car as if to wish it good luck, and then just took a step back. 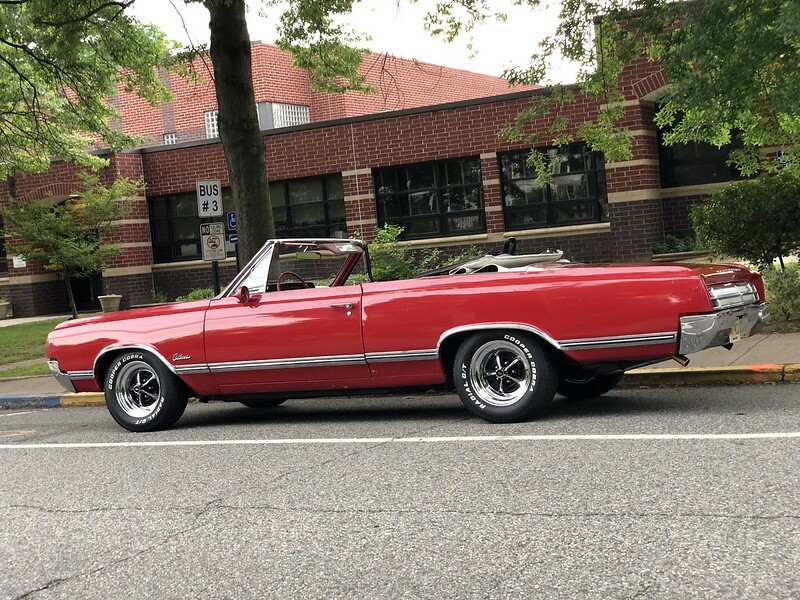 I keep teasing him that when the car is done it's going to win best in show and put his Riviera in the shadows but, the truth is we both just want to ride into a show together and spend the day enjoying the cars and our family, just as it had started this way 27 years ago. Enough with the mushy stuff. 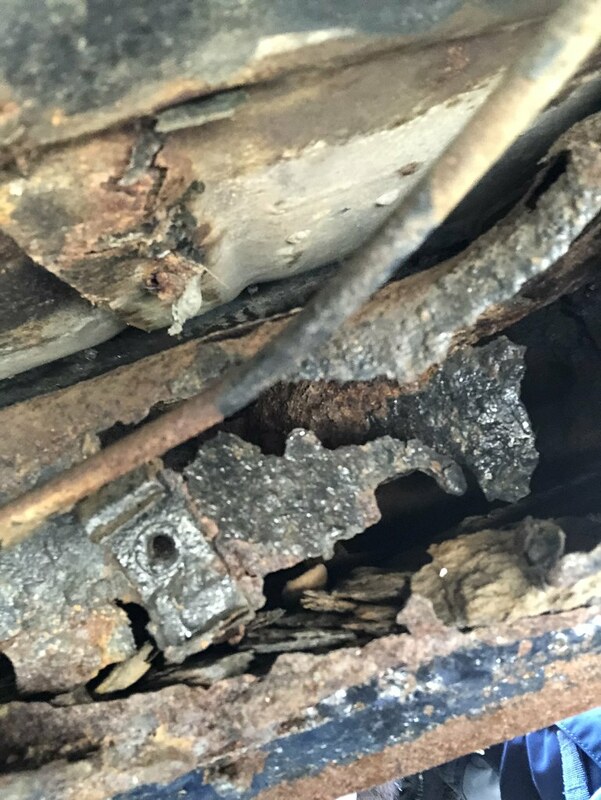 I've rambled on and on about how the frame is a pile of rust and is unsafe (but yet I drove it anyway!). 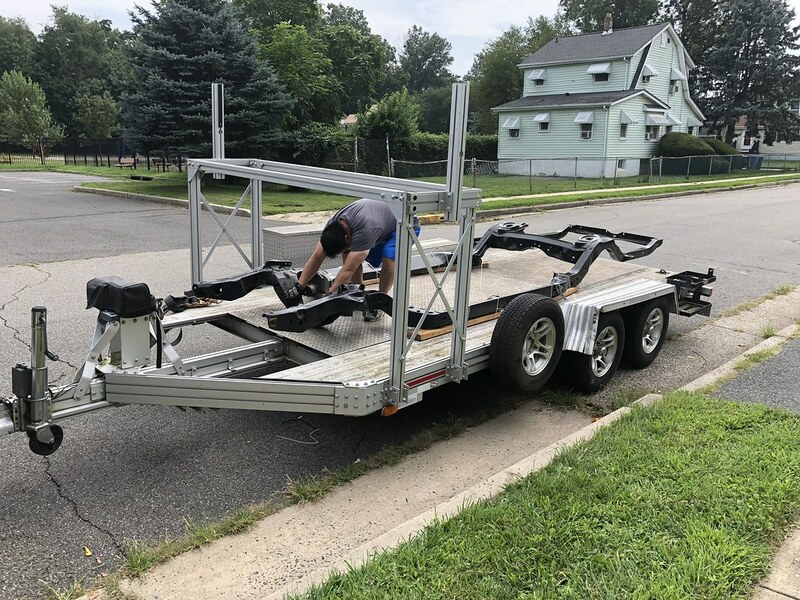 I was able to easily snap some pictures while it was being loaded on the trailer, here's some proof. My father was shocked when I showed him these. The restoration guy was finishing up a black C3 to put up for sale when he spotted some fish eyes in the paint. The car had to be stripped down and repainted which occupied the shop for the majority of December and January. Once they had room however, the work began and happened quickly. 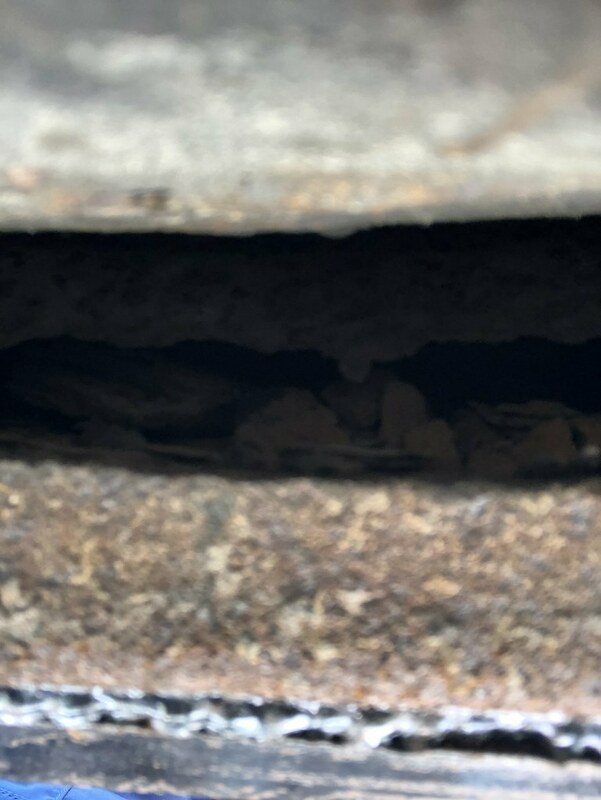 I received a bunch of pictures from Mike over the past couple weeks, some have me scratching my head "What the hell part is that?" and some had me just in awe. You'll see below what I mean. 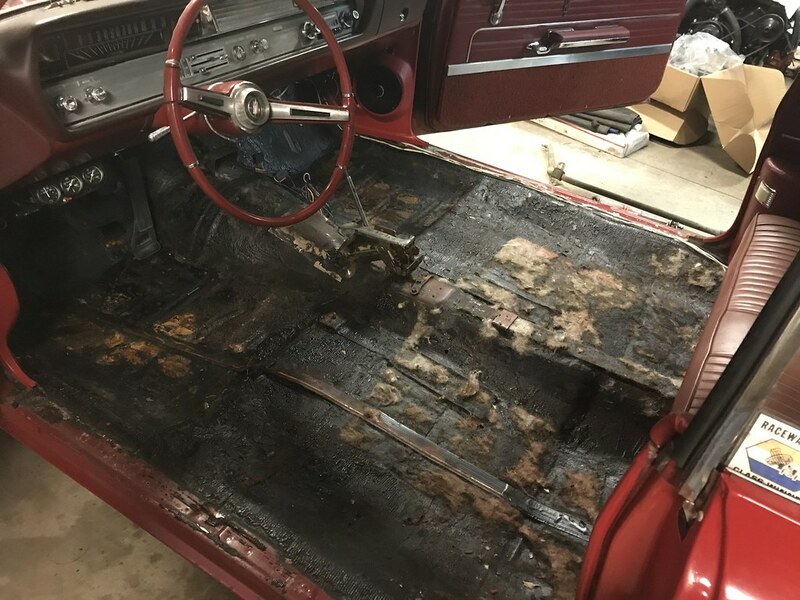 - It needs a new floor, completely. Lots of old patches that were riveted on. At some point a partial floor was done, and done poorly. 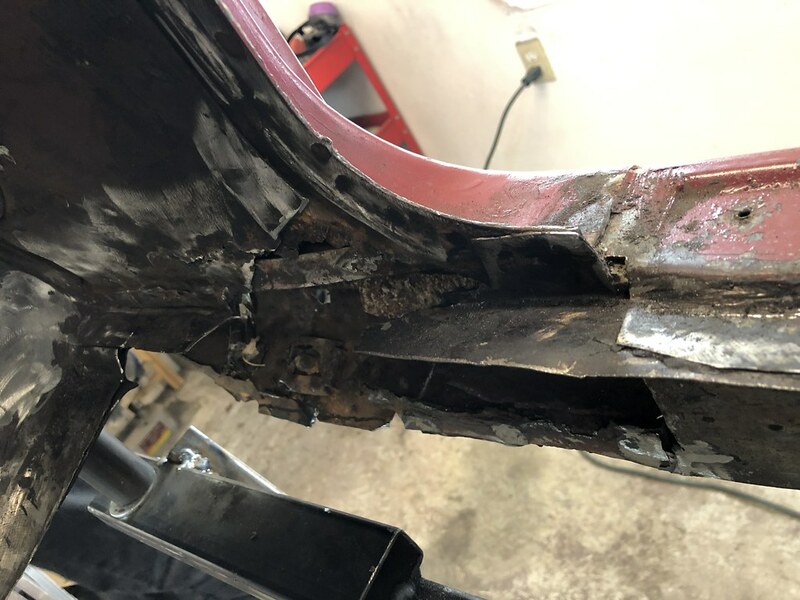 - Trunk floor needs to be replaced primarily due to the body mounts totally disintegrating. - The frame is TOAST!!! But we knew that. The good news is it all seems very repairable. I can't wait to drive it again, with how the frame was it's going to feel so much stiffer. On to the pics, I'll try and explain what you're looking at. 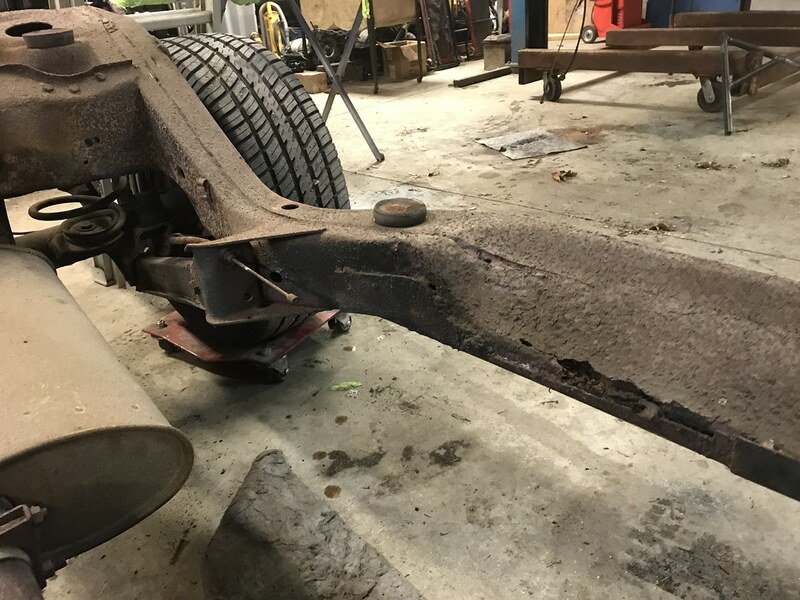 This is the rear body mount that connects the frame to the trunk floor, 54 years of NJ roads. I then got these pictures yesterday. 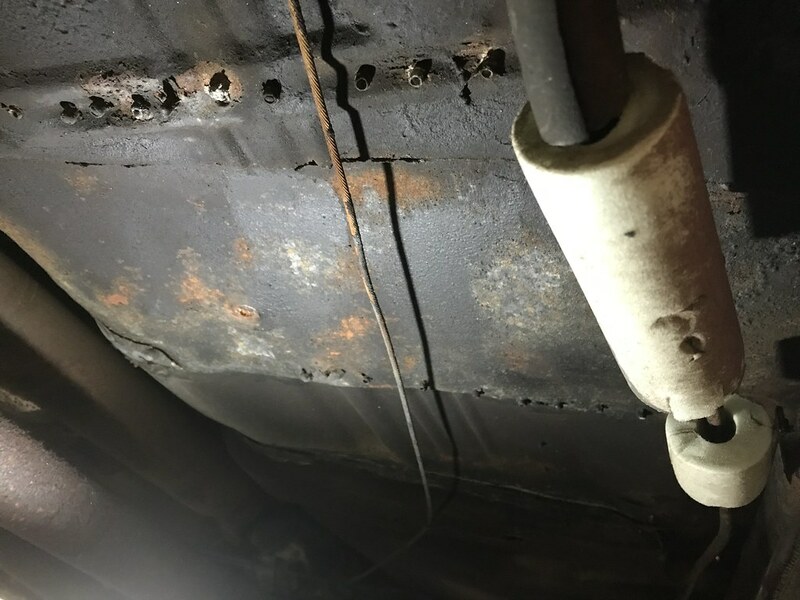 "3 out of 10 bolts came out easy, the rest broke or needed to be burned out." 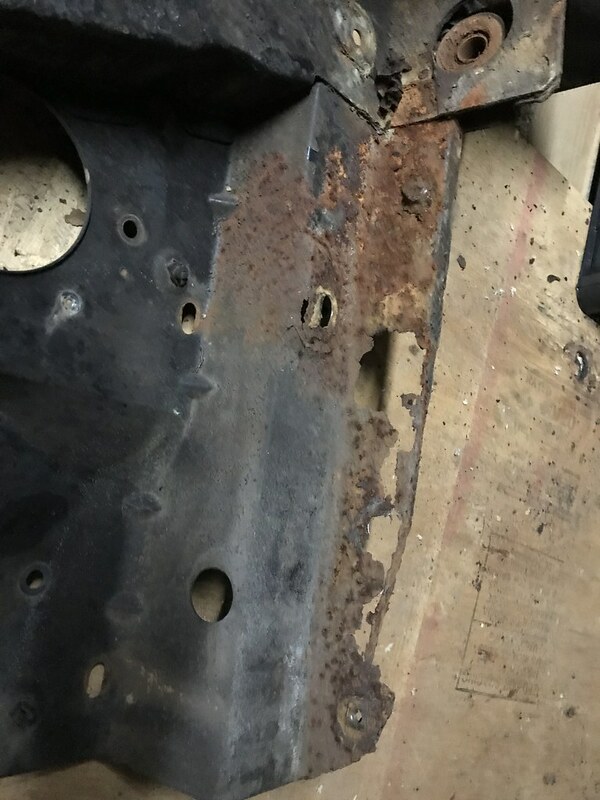 If you look at the above pictures you'll find various sized rust holes, scale, and what looks like paper thin metal. I can't believe this car has survived this long. I really don't know what was holding it together. The silver lining in all this is all the money I'm spending to get this done will be well worth it. I'm not replacing a mediocre part, this thing is shot. Probably has been this bad for at least the past decade. Makes me cringe to think I had my 3 year old in the car with me. I'm now on the search for good, restoreable trim and original bumpers. If anyone knows of any junkyards or people that may have these pieces, let me know! In recent years I've really enjoyed the format of Cars and Coffee (Cars and Croissants here). I was / am into European cars and that's generally what comes to our C&C. I always thought it would be nice to bring some classic American cars. I tried to get my father to take his Corvette a few times but he was fairly hesitant to drive it. As I mentioned earlier in this thread he LOVES his Buick and drives it frequently, sometimes for no reason at all. I figured that once I got the Olds we could run up to one together. At some point mid-summer I talked my father into taking a drive with me. It was about a 45 minute drive, all backroads on a Sunday morning. 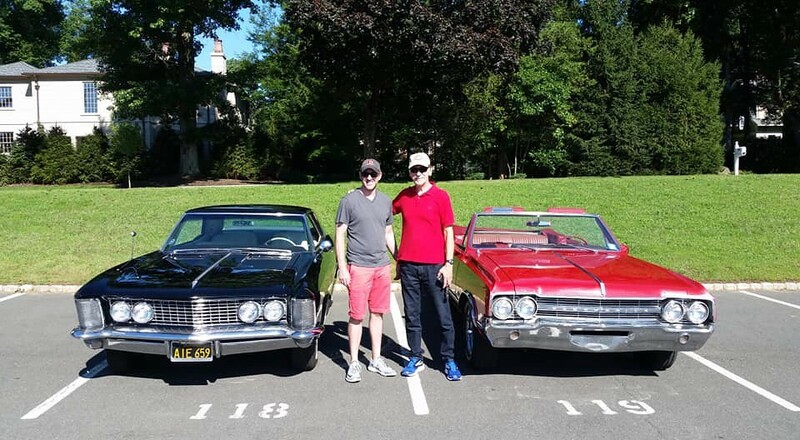 Great cruising weather for 2 old floaty American cars to enjoy some scenery. 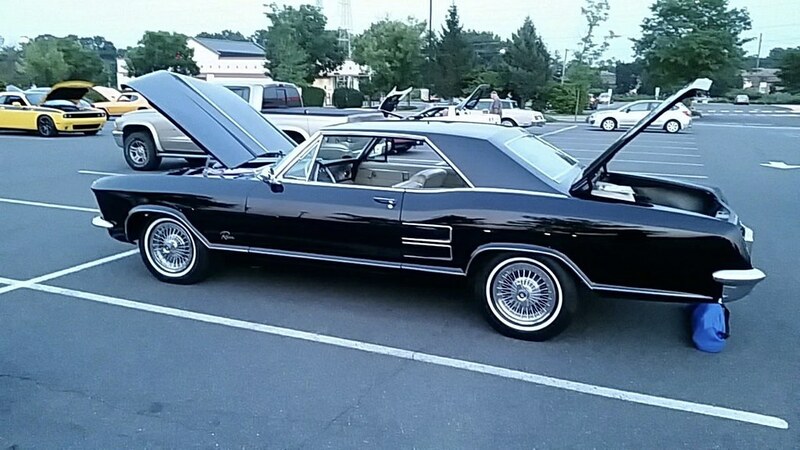 We pulled into the C&C and people flocked to the Buick, the Olds got almost no love. To be fair the Olds in person leaves something to be desired but, we were both astounded by how many people stopped by the Buick. My father spent a good 15 minutes talking to people about it before I tore him away to walk around the lot. Upon return to the cars there was another hoard of people. It was a cool sight to see. I don't understand the spring being out of the pocket being a big enough deal to swap wheels, usually an easy fix.. Nice work on the car. I read through the whole thing for the first time today. Great story! I have to ask....how did your mom like the car? I remember her driving it once, she hated it. Said it was too big. As a passenger she liked the idea of a convertible but I think a better term to describe how she felt about it was "tolerant". Probably the same can be said about my wife. Nice car and it will be a beauty when it's done. Until the later posts, my first thoughts were, "This car can't be THAT bad." She was a real 10 or 20 footer, but when you're done, it'll be a different story altogether. 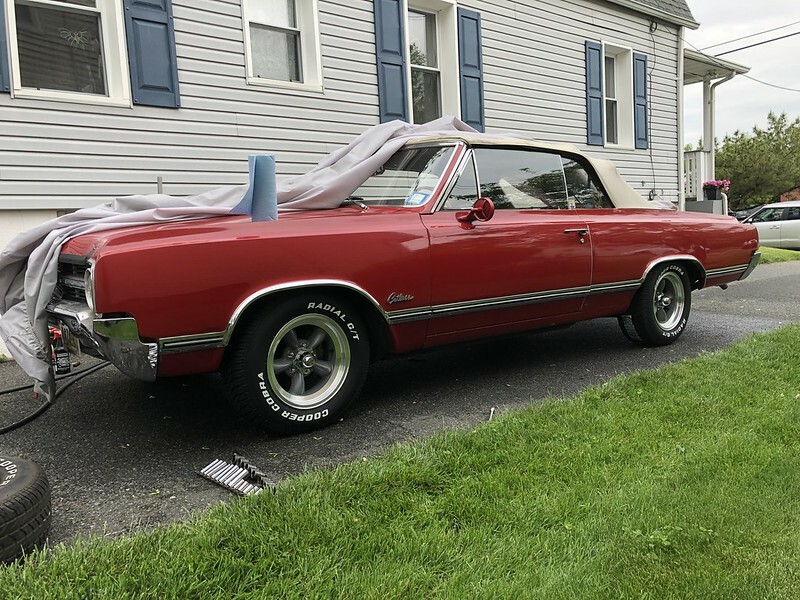 It's great that your dad held onto the parts from the parts car all those years, certainly makes the restore cheaper for you. Keep us updated, I love reading thru these rebuild threads, especially when they have such a personal history to them. You (or one of the admins) might consider moving this thread from General Discussion to Major Builds and Projects. Boy howdy! That is a sharp car, even before it goes in for restoration. Its amazing how a pretty exterior can distract the eyes from the serious structural issues underneath. Good snag on the frame! I think the SSIs were a good choice. 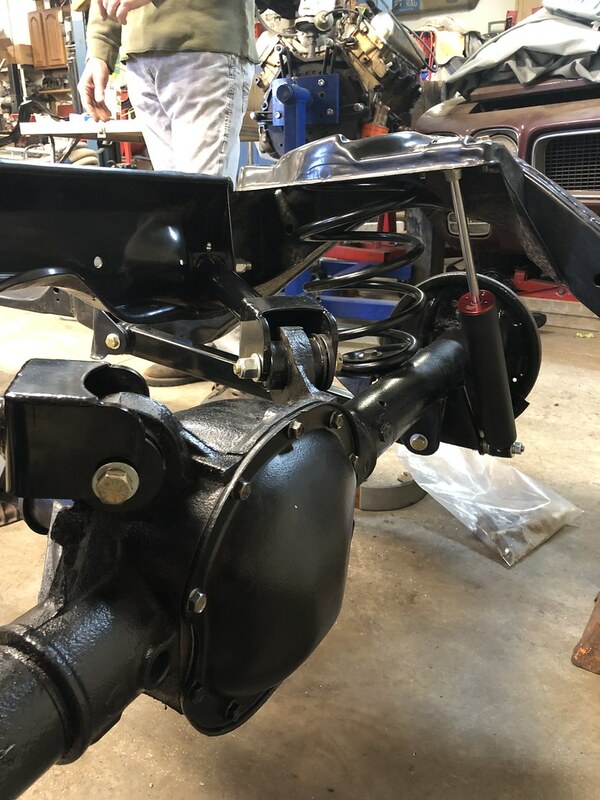 I have a co-working restoring a '65 Cutlass 'vert and he too had to get a parts car with a better frame. The engine, suspension and drivetrain is pretty much done, his body is being worked on now. As long as your daughter continues to like the car as she grows up, you can keep it in the family for another generation. My wife doesn't like the wind when I drop the top on my T/A, but she still gets in for the ride. your lingo "down the shore" suggests strong liklihood of living in Jersey for a time. yes ? Yes sir! My father lives about 5 miles from his childhood home. And I live about 5 miles from mine. Oddly enough the Cutlass has lived in the same vicinity too it's entire life. I guess none of us really went far in our lives! 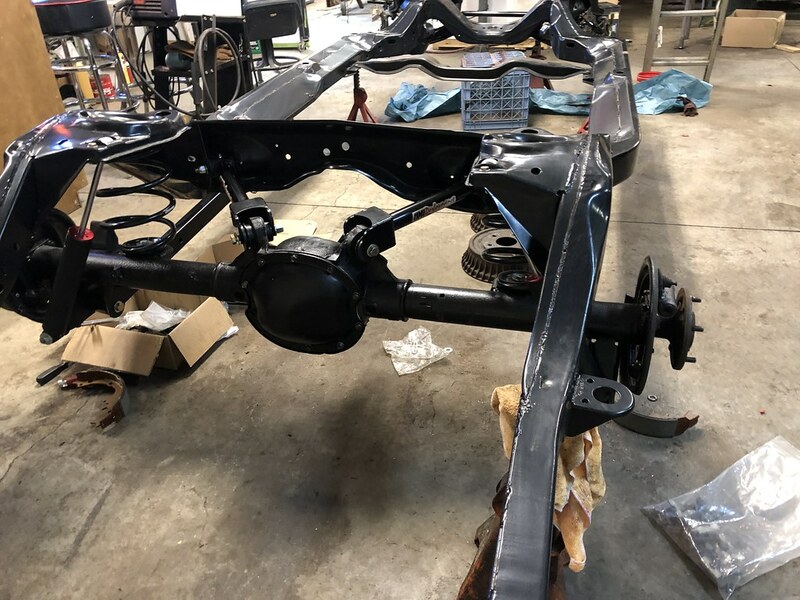 The chassis was pushed out from under the body last night and I got some more pictures from Mike. What a mess. But it still looks so good on those wheels! 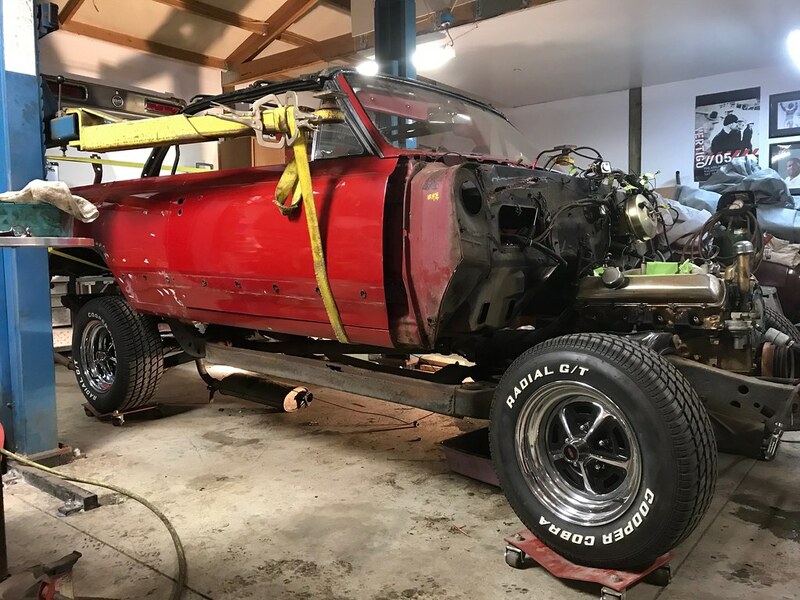 I went down to see the Olds this weekend, excited to see some reassembly happen but nervous to see what surgery has to be done on the body. As we went through the brakes and suspension I decided it was time to do some upgrades. 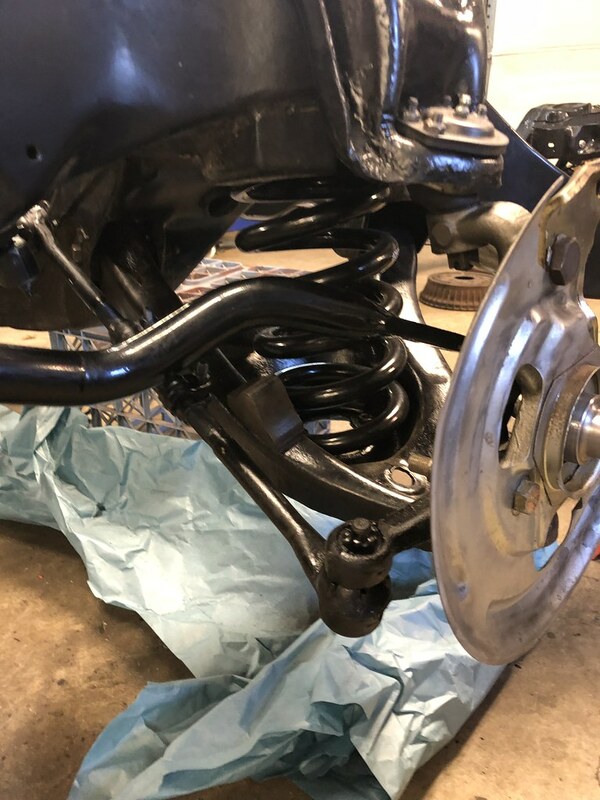 I opted for 1" lowering springs, a beefier roll bar up front, boxed rear trailing arms, tubular uppers and a thick rear bar. We got all new braking components, lines, springs, e-brake cables, etc. 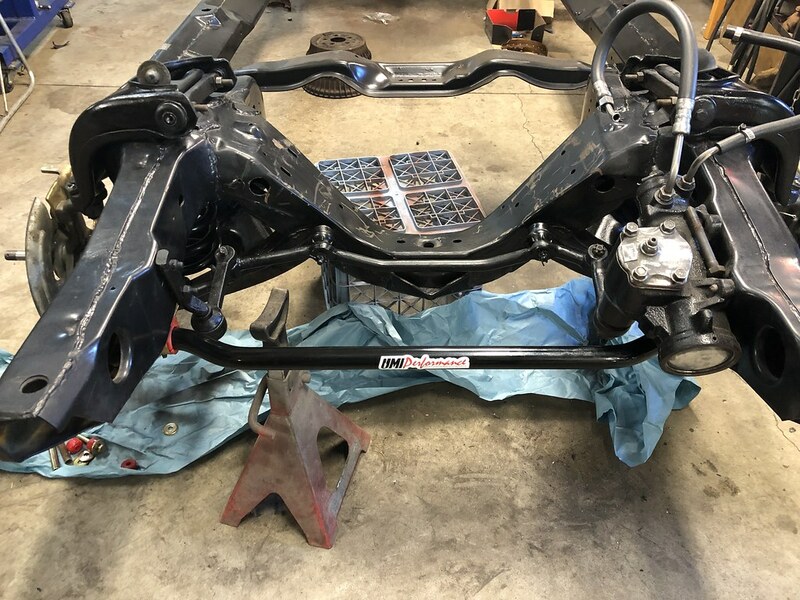 Most of it is installed on the new frame. There are a few bits missing which are on order, should be a rolling frame shortly. Engine detailing is next. The body is a whole different story. 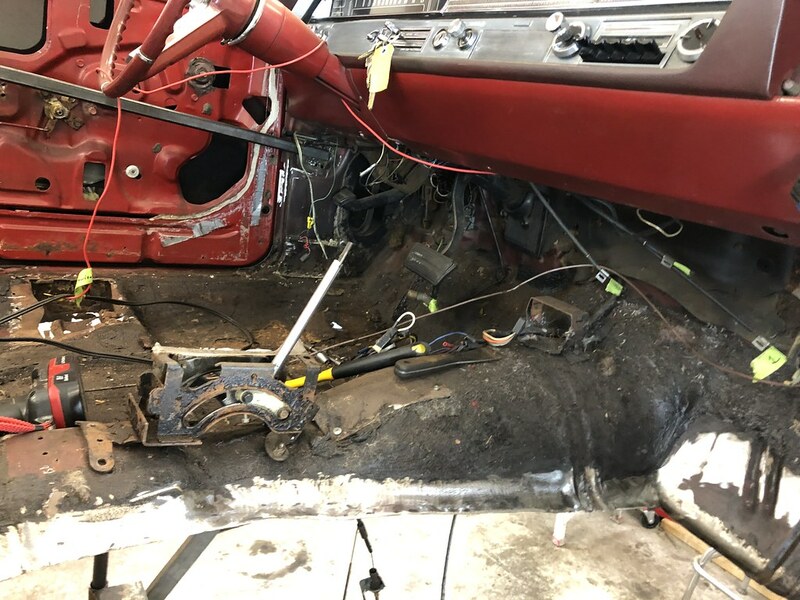 The passenger side floor is first, it was cut out, inner rocker is being patched, outer rocker will be replaced. 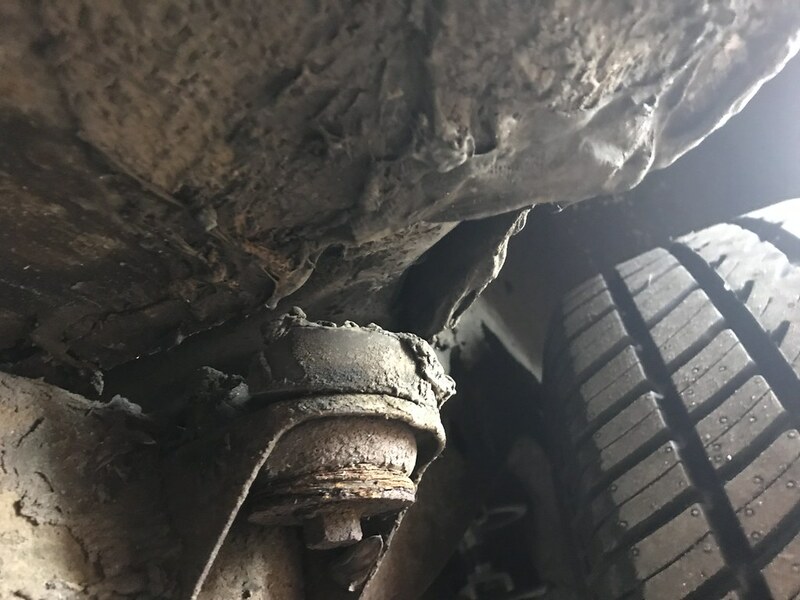 The driver's side is worse, it will need a full outer, inner, and floor. Nothing unheard of for a car this age but much more than I'm comfortable with. The body has been braced to make sure it stays put but it's still scary to me. Once the floors and rockers are done it'll be mounted back onto the frame for body work to start. I asked when the car would be done and was given a big shrug. 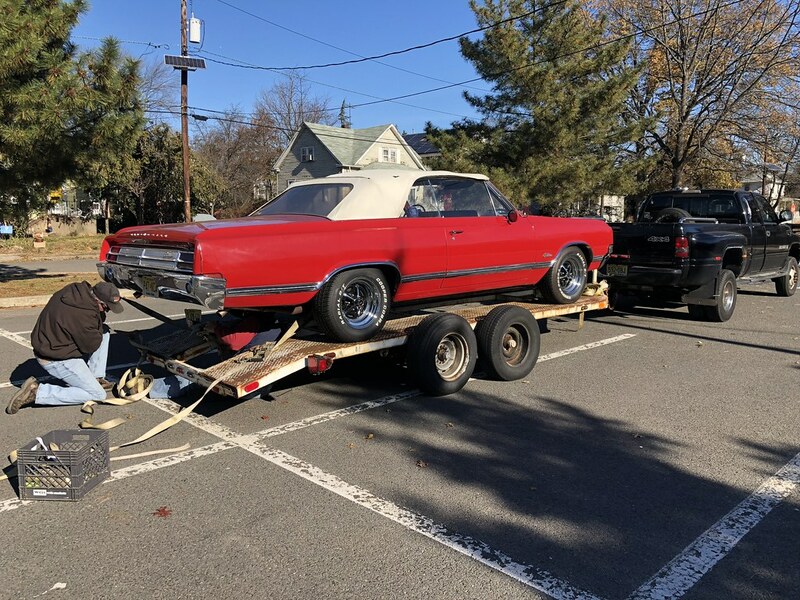 Quick Reply: Took ownership of my father's '65 Cutlass Conv.